We are currently helping a fast growing and dynamic company, based in Stockton on Tees, to recruit a Software Development Team Lead to help them increase the pace of their growth even further which will include growth into mainland Europe. This is a rare opportunity to join a (currently) small team and to gain positive self-development in a supportive and challenging working environment. As the Software Development Team Lead the larger proportion of your time will still be spent developing software but this is always done with a close connection between the developer(s) and their end clients. If you want to break out of being disconnected from your individual effort and contribution (and their impacts for end users) then this would be a suitable role for you. Fast-tracking your career and experience isn’t always easy – not usually within the same company that’s for sure. My client’s firm belief is in giving their team members early responsibility and encouraging them to develop themselves quickly. The reason is simple – as a company they want to continue to grow quickly and can only do that if their team members do exactly the same. We want to recruit a Software Development Team Lead who naturally buys into that concept and can develop a team in exactly the same way. Customer focus,	Continuous product improvement & New Product Development are their key strategic and operational focus, so the ability to actively engage with their customers, when necessary, will be a key strength in anyone taking this exciting role. Although there will inevitably be a good part of your time spent creating software, you must also seamlessly interact directly with customers whose sole interest is in what the product can give them as opposed to how beautifully the code is written. To match your personal strengths, you will need strong technical proficiency with SaaS applications running on Windows and Linux operating systems, excellent coding skills (they are a Java house) and if you can show similar competence with Apache Web Server and Tomcat Servlet Container that would be welcomed. They warmly embrace new technologies and openly encourage new thinking. We can offer you a strong remuneration package and benefits as well as the opportunity to become a shareholder in the business. But if this last sentence was the one you were really waiting for, perhaps you have missed the point of our advert? (quoting ref – ‘SDTL/09/17′) with your CV and a cover letter outlining your current remuneration package and key motivations for applying for this role. As we go into the latter half of the third quarter of the year (September to you and me! ), HR departments are gearing up ready for that annual jamboree know as the roll-out of the performance appraisal system. Most are timed to coincide with the pre-Christmas period and all of them generate emotions like no other management system ever invented. So why do these systems cause so much bother? The answer is that they dont! As always its a mixture of things, but the biggest causes of discontent are without doubt to do with the people who participate in the systems and not typically the systems in isolation. As with Sven Goran Erikssons much criticised system, it is only as good as the people using it at the time. If the players had adjusted their approach sufficiently they would have got better results. In organisations if employees regard a system as an immovable object it will not be working at its best for them. Its a fairly widely held view that far too many managers have been battered into submission by the imposition of these systems that they now fail to challenge them as perhaps they should. Far too many members of staff simply dont understand the very basics of performance review  why do the company do it in the first place? What does it achieve for the company? Etc etc. Each review of the system results in inexplicable tweaks that bewilder line managers. Be bewildered no more folks  its done to stop those awkward line managers (yes you!) from doing things during the process, and on the form, that the HR department just dont want you to do.The pursuit of a performance appraisal nirvana is actually an exercise in failsafeing the system against human meddling. The HR department are not the only villains though. Many managers will say one thing to the appraisee and another to the other members of the management team. Just as many would prefer not to give their staff feedback at all. Lets get one thing straight, the vast majority of people DO want feedback on their performance. If it is good they want the praise; if it is bad they want the understanding about what they need to do better and the chance to improve. The small minority who dont want feedback have stopped caring for some reason. In this instance you either have a de-motivated team member or someone who just isnt bothered about anything other than their pay check. The former needs a leg up; the latter needs a boot out! There are so many aspects to this expansive subject area that I will just cover the aspects of performance system set up and some of the critical issues you must resolve before even worrying about logistics and forms. When considering what type of system you wish to create one of the first things to resolve is just exactly how it will compliment and reinforce the company culture you want to have for your organisation. Having something that is incongruous with what you are trying to achieve certainly wont help and may in fact hinder your progress as a business. For example if you want to have a team orientated environment that involves high levels of mutual support, trust and information sharing then one of the most fundamental mistakes you can make is to have your review system focussed on individual goals, achievement and rewards. Ensure that your performance review system actively reinforces the way you want your staff to behave. To create a team emphasis ensure there are team goals for all team members, goals relating to the behaviours you want to see and team related rewards for successful achievement. One key issue involves one word in the phrase performance review process. The word review leads subtly to an over emphasis on the past when it comes to the structuring of the process.This backwards-looking preoccupation is further strengthened when the review timetable becomes annual or at best biannual. This typically forces all the good and bad elements of an individuals performance into one or two meetings at most. All the preparation focus and effort from the appraiser and appraisee then revolves around trying to negotiate what an accurate picture of the past should be. And why not, usually an appraisees future disposable income rests on their ability to establish the most favourable impression possible of their contribution over the review period. More often than not so much time is spent on reviewing that critical forward planning, goal setting and alignment of effort is rushed or worse forgotten altogether. Ensure that your policy, process and forms are dominated by the forward planning elements. If your HR department must quality check anything then they must ensure that the forward planning elements are done thoroughly and well. If they too are focussed on the backwards review then their behaviour is reinforcing the wrong things. One consistent criticism emanating from HR departments is that there is little or inconsistent commitment throughout the organisation towards the performance review system. If the staff and managers are consistently resistant and frequently noncompliant to the system then there is something more fundamentally wrong that is not being addressed by the moans of the HR department. If the staff and managers are complaining that the system is unwieldy and unworkable they just might be right. At that point its time for a fundamental change not a superficial review. Ensure that your system compliments the natural flow of contact between managers and their teams. Ensuring that the system is complimentary rather than just adding extra burden will increase participation and acceptance of the review systems greatly. One observational tip I would like to offer the England manager is related to his insistence that he never raise his voice or demonstrate annoyance. He is missing one of the fundamental motivational points about dealing with people. Different people like to be treated in different ways and some of his team will prefer the kick up the backside approach whilst others thrive on the democratic coaching style. In resisting changing his style he may not have lost the dressing room but he is not getting the best out of all his players. The lessons for line managers in performance reviews are that some members of your team respond to the carrot and some to the stick. Part of your salary is so that you are able to determine which style to use, with which person and when. The long running debates between the true born and the nurturists around just how leaders are created has rumbled on far too long. This writers view is very simple – children are born with lots of potential, none of which will reach its peak if it is not developed. There are just as many people with the innate leadership skills within them that do not make it into positions of leadership as do. This has much to do with motivation but we are not going to enter into that excessively large debate. The Charismatic leader has been the particular focus of attention over the years and has been the perfect example for the natural born supporters lobby to hold up as proof of the accuracy of their argument. However, to suggest that they are merely a sum total of the same genes they had when the midwife slapped their behind, is a ridiculous insult to the hard work and effective learning they do throughout their life. That is why I would prefer to refer to them as effective leaders – no more, no less. Effective leaders hone their skills many ways. They learn from elder statesmen, study and practice. Most of all, however, they learn by doing. The best leaders learn quickly that making mistakes along the way is inevitable so the important thing is that you recover quickly from a mistake and not let it dissuade you from leadership in the future. Good leaders work on their resilience and capacity to recover seemingly poor positions. All great leaders will quietly tell you just how many mistakes they made along the way and that they failed their way to success. What is important to them is that they have a cumulative positive result from their efforts over time. Much ink and paper has been expended trying to create a single definition of what leadership is and the competencies demanded of a good leader. I wont try to summarise this whole effort or develop my own apparently distinct definition. For now I would ask you to regard leadership and management as interchangeable to a large extent though I contend that leadership is much more about the hearts and minds issues than simple management of resources. It has seemed like a continual feature of business life these last several decades that new paradigms for leadership are being sought by business leaders the world over. In the UK we are deluged with books, CDs or DVDs, training courses and professional qualifications galore to tempt the aspirant leader and current incumbent alike. All in an attempt to persuade us that a new practical paradigm has arrived that can elevate you and your business to ever greater performance and results. There is now a recognized condition that robs people of their time and money in large measure. Known as TCAP, or to give it its full name – Training Course Attenditis Perpetua, it draws people into an invidious cycle of attendance at training courses that is deeply persistent in nature and difficult to stop or assuage. Indeed these people can draw a significant proportion of their feeling of self-worth from persuading their superiors to finance their little training addiction. Worse still are the superiors who want to foist training on weary managers who really have seen all this stuff before but must now, once again, put on their best faces to satisfy their superiors that they are entering into the true spirit of the development. Perhaps at this stage you may be forgiven for thinking that I am heading towards my own conclusion which is that this plethora of management development material isnt really needed? Far from it! As a consultant offering management development services myself that would be a somewhat disingenuous stance would it not? All too often many of these development activities over-promise and underdeliver. As the motivation of the course is replaced by the drudgery of the journey home, course notes gradually lose their appeal and are consigned to the darkest shelf in the darkest room to gather dust like all the rest. The main reason for this is that too many of these courses focus almost entirely on the transfer of knowledge alone. The better ones give skills, whilst the best allow sufficient time to ensure action planning that covers changes to attitudes and behaviours to allow new found knowledge to be successfully deployed. Ensure that a formal coaching relationship is established between student and a senior manager/director, thus allowing behavioural and attitudinal aspects of their development to be considered and worked upon. It is this coaching that will help to keep the aspirations and abilities of the student firmly aligned to the direction and needs of the business sponsor. Coaching as a continuous method of leader development would provide a better option. It is the most reliable method of developing your own leaders but it is not without its potential drawbacks if not done well. If expectations of how complete a leader can really become are too high, and they frequently are, then the new leader is just as likely to drown beneath the waves of expectation as rise to walk on the water of success. Leaders should not be expected to be all things to all people but far too many HR departments sponsor ridiculously comprehensive leadership competency models that no mere mortal could aspire to. Equally there are silly debates about whether the coachee should focus on enhancing their strengths or improving their weaknesses. The answer is simple – work on what is likely to have the most benefit at that time for the development of the leader and for the good of the business. Recognise too that new skills and behaviours take quite some time to acquire and to use competently. It is a common understanding that a simple new physical task may take up to 21 days of regular practice to embed properly. Learned and automatic behaviours will most probably take even longer to address fully. Another popular method of leadership development is the outward bound course. As a lover of outdoor pursuits (and a previous outward bound leadership course attendee) I can tell you that they are normally very enjoyable. But the claims about just how transferable the experiences are back into the workplace are usually heavily overplayed. The simple truth is that much of the experience will not transfer back into the workplace at all. Their value as an experience is usually more about people being able to interact in a more relaxed way than they would normally at the workplace. People frequently feedback that they now saw their colleagues in a different light after being on outward bound together. Trouble is that most outward bound courses are filled with unremitting activity and thus limit this opportunity to interact. Good leaders are an essential mix of rudimentary instincts, provided for them in their most basic biological building blocks, and persistent self-development. One without the other will not produce an effective leader. Dont stop yourself from investing money on developing the leaders of tomorrow but make sure that it is money well spent. Develop those individuals who show the motivation to suffer all the bad elements of being a leader as well as the good. As a final point dont forget to review the type of corporate culture you want these leaders to work within to ensure that you give them the best chance to succeed rather than create an inevitability of misdirected effort and the surety of growing resentment and frustration. In companies today the outlay of capital expenditure is submitted to rigorous scrutiny. Hours upon hours of management time (and no little heartache!) are poured into trying to ensure it will deliver the very best for your venture before you buy it, and testing that the item will be able to stand the stresses of what it will be expected to do. Can it work at the right pace? Will it start when you ask it to and respond reliably over time? Will it deliver the right level of quality to show this business in the very best light? Will it give the customer what they want? Can you reasonably expect it to work effectively with your other machinery? Does it have any particular quirks and foibles that may make it difficult to work with? Does it have a proven track record? How flexible are the outputs you can expect from it? What level of output can it sustain under normal conditions? What if you had an unexpected surge in demand – could it respond? How can it be developed in the future if it needs to grow with the business? All this, and more besides, for a piece of machinery. No doubting that it is all good solid stuff. But what do you do about your investment in your people before you ‘buy’ them? After all it’s a very common observation from managers of most businesses that it is the people that cause the most problems – not the machinery. Think about it, all the above questions apply equally to your potential investment in people. And people can represent a much greater level of investment in pounds than most companies ever contemplate ‘shelling out’ on equipment. I must point out that I fully accept (before an enraged reader feels compelled to phone me and put a rather large bee in my capex!) that all the effort in buying capital equipment is essential risk management. What I would like to persuade people to do is also regard the effective hiring of staff as essential risk management. If you want to recruit good people, and keep them, you must make sure your recruitment processes address all the key areas to help you get, and keep, a good employee. One key first observation is that whatever you do in your recruitment process you must make sure that it is done professionally. If your recruitment effort comes across to the candidate as unprofessional, disorganised and poorly structured, the candidate will be left with the impression that the rest of your business is much the same. Make sure that anyone involved in recruiting people for your business knows the standards that you expect of them. I’m sure you can think of others. If not ask your staff for bad examples from their past, they won’t struggle to give you a few! For most companies, at least for those that have yet to see ‘the light’, the process of recruitment revolves around two things – how quickly and how cheaply can they recruit someone. Time and time again this is the root cause of the ‘people’ difficulties further down the line that managers complain so regularly about. Nevertheless far too many managers continue to operate with these two drivers underpinning how they run a recruitment campaign. Putting a bum on a seat may well tick the box on the To Do list, but all too often it creates a long list of new To Do’s aimed at managing the after-effects of a poor choice. That choice is the fault of the recruiting company and NOT the interviewee. They made the offer in the first place, the interviewee merely said “yes”. Most companies rely heavily, if not exclusively, on the traditional face-t0-face interview alone in order to select their staff. It clearly has an important place in the overall process but it has long been accepted that the interview has many flaws in its make up. These are made worse if the interviewers are lacking in skill and experience. The interview will also not effectively target several elements of the risk inherent in securing the best candidate. Staying in their comfort zones means most interviewers focus on the technical knowledge and qualifications areas highlighted in Figure 1.1. It then becomes an issue of ego for the interviewer who tends to prefer the candidate who is deferential to the interviewer’s achievements and ability. I’m sure there is a psychological complex for this but this author doesn’t know the name for it. In figure 1.1 it has been assumed that a traditional interview is conducted and that all the interviewers are trained and experienced. With a competent interviewer, they should be able to get reliable evidence for the areas shaded green. For the blue areas it would be ‘hit or miss’ if you found reliable evidence and the red areas wouldn’t be covered. For a large proportion of your key vacancies I’m safe guessing that you would want to assess an individual’s knowledge, skills and experience in the areas shown in figure 1.1. Traditional interview approaches leave more than two thirds of the areas not covered adequately or simply not covered at all – regardless of how good the interviewer is at their job. Now ask yourself the question – would I risk buying a piece of equipment knowing so little about it? No? Then why buy a member of staff knowing so little about them? It’s quite simply storing up potential problems further down the road of your employment relationship with them. And the type of problems I am referring to are not the gross misconduct type, rather the variety where a new member of staff just isn’t performing against expected standards. As any experienced manager will tell you, the trouble with that sort of problem is that it tends to demand much more management resource to deal with it than a gross misconduct case. So how can you go about minimising the risk of recruiting someone to a more acceptable level? Some solutions to this involve complex recruitment procedures or the use of expensive consultants, neither of which are absolutely essential. A well-constructed Assessment Centre will target the areas relevant to a particular role with a series of carefully chosen exercises. They don’t need to be expensive. For instance, a comprehensive personality profile could cover management, leadership and even selling styles. It would cost no more than £180-300. The ‘pay off ‘, however, can be significant. Using the personality assessment at a final interview can also produce individually targeted questions that will further reduce the risks when choosing a candidate. Making sure that your managers are trained in effective questioning and interviewing techniques can be done quickly and costs effectively to help your interviewers get to the issues that really matter. You can then effectively turn each of the red and blue areas in Figure 1.1 to green. No recruitment process is absolutely guaranteed to return perfect results all the time. What is certainly true, however, is that if you target the elements of the process at all the elements of risk, you will have a far greater chance of getting the results you really want for your business. If you haven’t got an HR department with skilled interviewers, why not ‘contract-in’ that service as and when you need it. Hourly rates for experienced interviewers to sit beside you in the recruitment process should be between£65 and £80. Not too much more than the charge-out rate for a mechanic when your main dealer services your car! And you thought they would be too expensive! The process of recruitment is riddled with risk – refer back to my article Recruiting is a Risk Business. The underlying contention of that article was that any organisation must limit their exposure to risk by systematic, and preferably structured, assessment of all potential candidates. In so doing you should cover the hard and soft skill requirements demanded by the role as it currently stands and for how the organisation needs it to be performed in the foreseeable future. Determining what these requirements are is critical to the success or otherwise of the recruitment process  if you dont know where you are supposed to be shooting the arrow, how do you expect it to hit the target? You skimp on this stage at your peril.Yes, yes, I understand all that! I hear you say to me with impatience riddled throughout the statement. My 16 years worth of experience, however, tells me that most managers use time constraints as an excuse to devote too little time to this critical early stage in the process. And yet your whole project, and its chances of success, hinge on this more than any other aspect in the recruitment effort. If you can clearly define what you want when you commence the process, trust me, even an averagely skilled recruiter can spot a well qualified candidate when they see one! Once the foundations are created you can then build the other aspects around them. That includes the techniques you will use to assess how the candidates match up to your well produced brief.These techniques can be many and varied but are usually bundled together under the heading of psychometric assessment. In my travels the discussions I have had around this subject produce the usual mixed bag from the fervent detractors to the devoted supporters club. So we arrive at the pivotal point in the debate around whether to use these tests or not. Dont be dissuaded by feedback from candidates who just dont like doing these sort of assessments  they are not taking the largest part of the risk remember! It is estimated that upwards of 2 out of every 5 CVs have significan exaggerations, inaccuracies or even bear faced lies  you need all the help you can get to identify them accurately. It is now accepted in all sensible quarters that using interviews alone has strong limitations that discriminate against good candidates that just dont interview well and yet heap excessive kudos on the skilled interview game player, or worse, the proficient fraud. The added cost of completing psychometric assessment is usually dwarfed by the level of resources the successful candidate must control or by the costs associated with managing a poor performer out of the business. If you are not convinced by that lot then you must be an Im a fervent detractor t-shirt wearer. In which case read no more! In chatting to a number of experienced HR professionals and consultants, as well as using my own experience, the consensus is that most senior managers and executives are happy for other people to sit through psychometric assessment but become markedly more hesitant when they discover that they may also be asked to subject themselves to it. Ive been doing the job for years now, if you cant assess me based upon that, then I dont see why I should waste my time doing tests.This is a fairly typical statement from the small proportion of people that choose not to sit tests.Thats their choice, but its your choice to set sensible candidate evaluation processes in place and you lower your standards at your peril. A significant number of HR professionals, and recruitment consultancies, that offer psychometric profiling, are more than happy to use these tools for all levels below senior management but seem reluctant to adopt them for senior managers and directors. Part of this, Im sure, revolves around embarrassment  being too embarrassed to ask an apparently time-served and highly successful manager to sit through these tests of their competence. I chatted to an experienced consultant this week who recounted a story of a candidate for a very senior Engineering Manager position. This candidate objected strongly to being subjected to these apparently meaningless tests of his competence and promptly removed himself from the recruitment process. One has to ask, what was his motivation? Several likely explanations exist  he was nervous of being exposed as less talented than his CV declared; he was not interested enough in the job in the first place to put himself out and complete the assessment; he was ill-informed about the best practice standards applied in recruitment and youd have to ask what standards he would apply to recruiting members of any team he managed; he was intolerant to the standards being set by people within a different professional discipline to his own and you can only surmise that he would remain less than balanced, and a potential source of conflict with other professional colleagues. Characters such as this should be bracketed firmly in the no loss category. That doesnt mean that you should be dismissive or rude towards them but you should certainly make no concessions to the standards that you apply. In each case you should try to persuade them that being assessed is a routine part of the process and is only one part of the decision-making criteria. But dont waste too much time as fervent detractors are usually intractable in their opinions regardless of any argument or evidence. I would contest that they are not the sort of person you would want in your organisation if that is their approach. A significant change should occur in the focus of your psychometric tools the higher you apply them up the organisational ladder. The shift should move towards closer scrutiny of the soft skills rather than the easy to measure. Retain the verbal and numerical ability tests by all means as they will add some value to debates around a candidate and cost relatively little money to do. 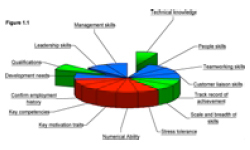 However, the key arena of value will be around the leadership skills and management styles the candidate uses. A mismatch here means that all people within their sphere of control could be adversely affected by them once recruited. It is critical therefore to evaluate them as closely as possible. A good recruitment consultant should be able to offer you help in devising a structured approach to the right tools to use. Unfortunately a lot of recruitment consultants offer only the more limited first interview service. If that describes your recruitment consultant, work instead with one that can help you assess the right candidate all along the way until an offer is made. After all, if they were true partners with you then their goal should be the same as yours, namely ensuring the right candidate is placed into the vacancy you have. In closing I would argue that far from being less inclined to psychometrically assess senior candidates I would, in fact, be much keener to do so bearing in mind just how much the presence of ineffective soft skills can have a truly hard impact on any business.